Empire Avenue is a social game, where you can buy shares investing on people, whose values will depend and change based on their interaction with other users. Officially existing since more than 3 years, it was founded on February 2010, available in a closed beta and launched for everyone on July 2010.
you are active on the most famous social networks connected. Warning: when talking about buying and selling shares, we do not refer about real money. Inside this social game the currency is called Empire Avenue “Eaves”, and it is a virtual currency: you do not have to spend any money to “play” (well, unless you want to, because you run out of eaves and you desire to purchase more – check the shop here), you just need to socialize and interact to earn eaves. After you sign up, you set up your account connecting different social media networks like your profile of Twitter, Facebook, Flickr, YouTube, LinkedIn, Instagram, Google+, and also the feed of your blogs. 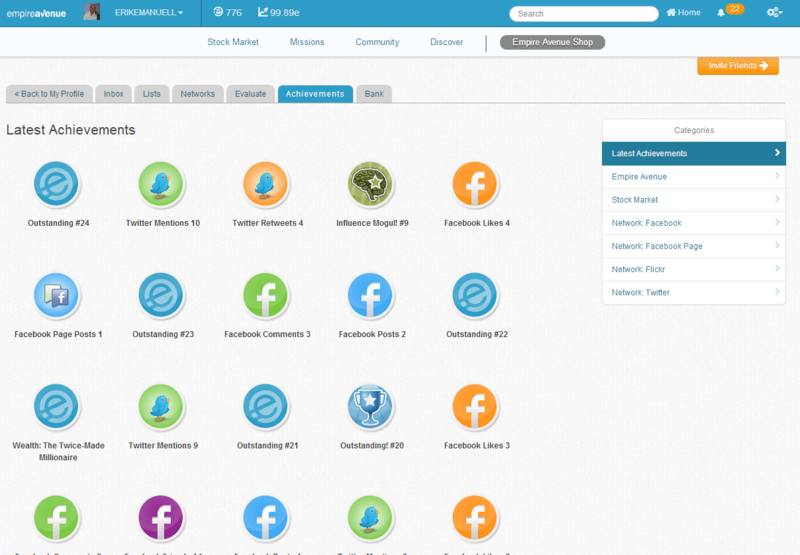 Any of the activities connected with your profile will be adequately compensated, also with special badges. In Empire Avenue, in fact, there is extensive use of gamification mechanics : for example, with the increase of the mentions on Twitter or friends on Facebook, you will receive a different badge and a handful of Eaves, which you may use to buy new shares on users or start new missions. Always keep in mind that Empire Avenue is just a social game, and it’s easy to get addicted to it. After this reminder, let’s see how you can invest your eaves wisely. First of all you want to interact with other users (this is the secret of your Empire Avenue success), so you need to understand who you want to invest your eaves in. You can check the leaders in your network or you can search for people you already know outside Empire Avenue. May be you just want to let the system suggests you the people you might invest in (I guess it’s based on a fast share price growth). Then you can spend your eaves starting a mission and rewarding people suggesting what you want them to do. For example, you can create a mission inviting people to like your Facebook page (let’s say, for 5000 eaves for example) or rewarding users to ReTweet some of your content (for 3000 eaves, for instance). Basically, you can increase your social media audience with different networks “paying” for it with eaves. Of course, you can complete the missions of other users, in order to increase your eaves. Honestly, Empire Avenue is not easy to explain in a few words, but at some days if you have a little “free time”, I invite you to try it and give me your feedback. Maybe you will find there are some nice alternative to the traditional and more popular Facebook or Twitter. Just pay attention to not get addicted to Empire Avenue! Thanks for sharing the detailed breakdown! It’s a funny platform, you just have to sign up and enter for 5 minutes, from time to time. You’ll see some benefits, though. Sounds interesting ! Am gonna give it a shot today itself .Its good to see games and technology evolving that helps people in different ways and bloggers like you keep updating us on these technologies and applications for us to benefit .Thanks for sharing this game with us ..it would have been unnoticed by most of the people (including me) if you hadn’t shared this information with us . Glad you enojoyed the article, Pramod. I am on Empire Avenue, and I must say that the first few days were very addictive. Almost all the time I was watching my share price rise. But then slowly as the price became constsnt, the addiction went. Nowadsys I just login there, do some missions, purchase some shares specially of the newcomers (cheap price). But yes, it is a great place to post some missions. If we want some retweets or likes, then Empire Avenue is great for that. I am following your strategy, Sourav. Even if you do not login for days, when you do it, you will find free eaves to create some missions and increase your social media audience. I couldn’t find your link anywhere in the post Erik. I also tried searching for you on Empire Avenue, but couldn’t find. Would love to but some shares of yours. Well in my own opinion, increasing your scope of audience is not hard to do. But keeping them active the way you want to is never easy. You have to think in advance how you should approach in order to get their sympathy and eventually experience the popularity in social media. EA will definitely helps you increase your social media audience, Skye. I have never listen about this type of game. But after reading this blog i think it is nice one. Thanks for this nice blog. I have been also at Empire Avenue for almost two years, beside being a great and fun way to build relationships and build your presence, it also really helps you to know how people looks into you and your blogs as a place to invest in. Thanks for sharing this great review.